After taking out the $1,000 mark in mid-September, gold has continued to charge higher, and is currently trading at $1,088.90 per ounce. In just the past year alone, the price of gold has increased from around $750/oz to nearly $1,100 per ounce. Many people believe that this is just the start of a parabolic move for gold over the next 5-10 years. The price of gold was given a boost over the past couple of days when it was announced that India would be purchasing 200 metric tons of gold bullion from the International Monetary Fund. This worked out to a purchase price of nearly $7 billion dollars. The International Monetary Fund announced a few weeks ago that they would be selling over 400 tons of their gold reserves in an effort to bolster their finances. So what's going on? 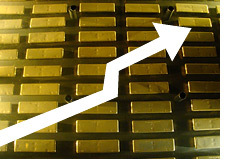 Why is gold soaring to the heavens right now? 2. Many investors are buying gold to hedge against inflation. Many are anticipating increasing inflation in countries such as the United States and the UK, based on the theory that these countries will need to continue to print money in order to pay for their deficit spending. 3. Overall bullish sentiment for gold. It certainly doesn't hurt when you have people appearing on major TV networks and predicting that gold will hit $5,000 an ounce. How high will gold trade over the coming weeks and months? No idea, but I certainly wouldn't want to bet against gold right now..